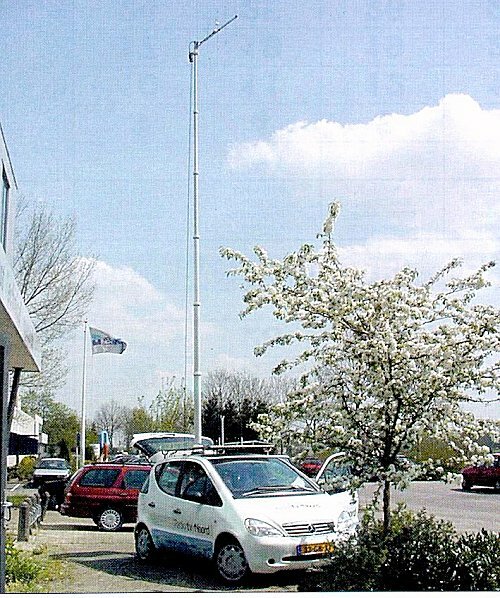 The Clark Masts PT Series (the first of this series being the PT1) were the very first air operated Clark Masts portable masts to be developed by Alec Clark, and now form part of Clark Masts Phase 2 Series. 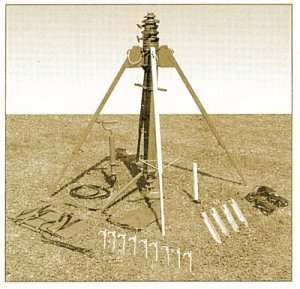 The early air-operated PT Series telescopic portable masts featured heavy aluminium alloy construction, anodised for corrosion and ware resistance, keyed tube sections enabling the PT portable mast to be turned, adjustable bearing surfaces for long life, 114.3 mm (4") base tubes and a coned ring system for rigidity when fully extended. Today's Clark Masts PT Series portable masts still carry these features plus torsional locking and other improvements. 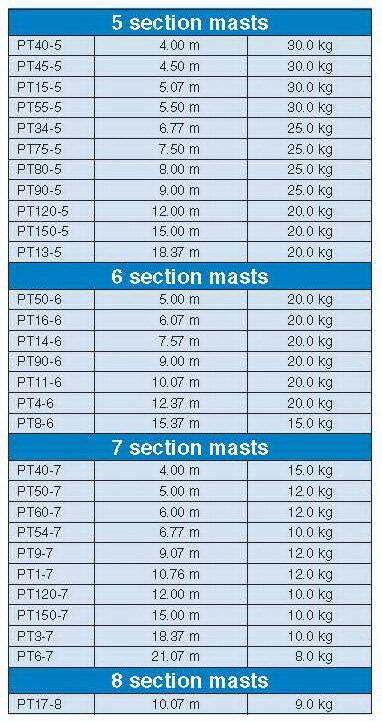 Like all Clark Masts air-operated telescopic portable masts, extension is by low pressure Air Supply, maximum pressure is 1.8 kg/cm3 (22 psi). PT series portable masts can be operated from various air sources, including 12 or 24 volt DC Air Source/Mast Controllers, 230 volt AC Compressors, Petrol Compressors, handpump or even a vehicle's own compressed air supply if available. 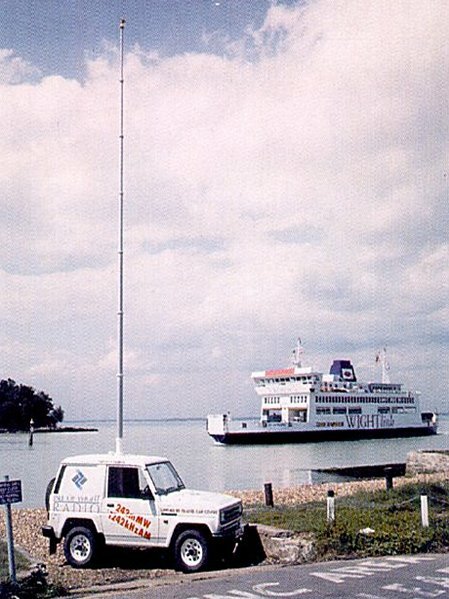 From their introduction in the late 1950's the original Clark Masts PT portable masts were immediately attractive to organisations involved in television field strength measurement and for radio/television news reporting vehicles. Today, they are still the first choice for these applications and more, including aerial photography, emergency service communications and radio/cellular site surveying. The base of each Clark Masts portable mast is fitted with a pressure relief/drain valve and an air inlet connector. Clamp (locking) Collars for semi-permanent erection, even after the air supply has been removed, can be factory fitted as an optional extra. All Clark Masts PT series portable masts are supplied with guy rings and mounting hardware for turning or non-turning applications. 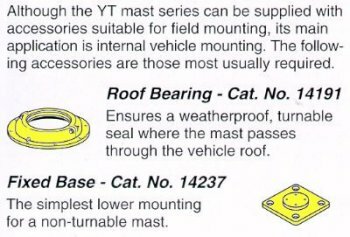 Clark Masts have a wide range of Mounting, Guying and Air Accessories available for the PT portable mast series, including Vehicle Roof Mounting Trolleys and field mounting Tripods. 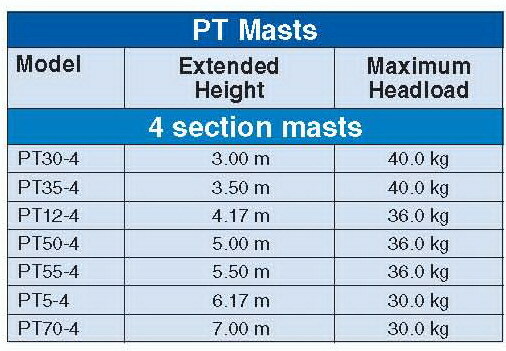 The Clark Masts YT Series of portable telescopic masts is a development of the PT, however it features a 127 mm (5") diameter base tube (the PT has a 114.3 [4"] base) which increases their weight and height capacity. 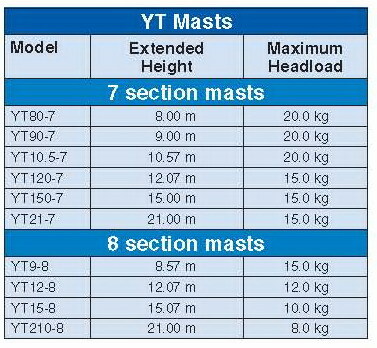 In other respects the YT series portable masts is essentially the same as the PT portable mast range. 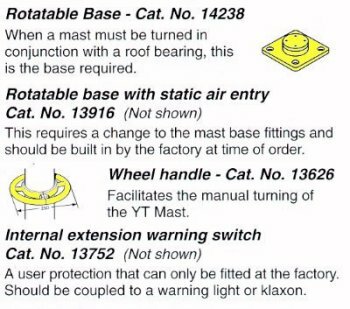 Both the PT and YT form part of Clark Masts Phase 2 series and are available with plain (non-locking) guide collars for low retracted height or locking (combined) collars, used for long periods of extension and/or without a continuous air supply. There is also a very full range of accessories available for easy installation in a wide variety of vehicles and shelters. 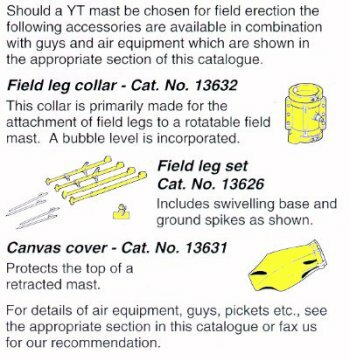 In addition the Clark Masts YT Series portable masts may be tripod field mounted and guyed using Clark Masts Accessories. Clark have a number of Air Supply options available for these portable masts, including allowing the use of a vehicle's in-built air supply, hand pumps, a petrol powered compressor and 12, 24 volt DC or 230 volts AC Air Source/Mast Controllers. High strength Corrosion-resistant Aluminium Alloy. Anodised natural colour or dyed. 1.7 bar (25 psi or 1.8 Kg/cm sq.). +55 degrees to -40 degrees C (dry). +65 degrees to -55 degrees C (dry). Expected pressure drop: Zero to 0.4 bar (0 to 6 psi). 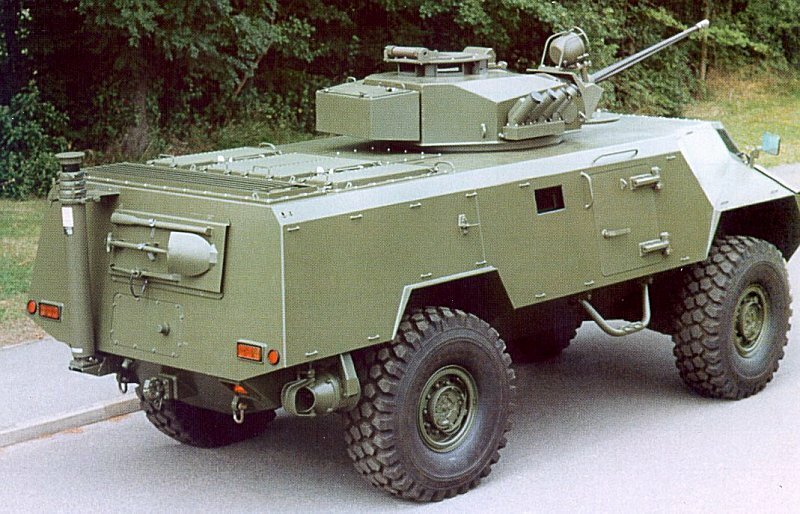 AQAP 120 including ISO 9002.